The first Sentiment Saturday of 2019! I sure hope I remember to write 2019 from now on. Last year I was horrible at remembering to change the year to 2018. It took months! I’m already feeling better about it being ’19. Haha. I’m so excited to be kicking off the new year with another project using the brand new Unity Stamp Company sentiment kit. I’ve been thinking about this kit since July, but in the stamping world that is the time we switch over to fall and winter images. This little butterfly had to hibernate a few months. She is finally here today to spread her wings and I hope you’ll love stamping with it and all the lovely sentiments too. There is just something about adding that extra layer of dimension that takes a card from “pretty” to “oh my goodness that’s amazing”. This simple technique does just that. Good Things with Wings is just perfect for this technique. I created the two different sized butterflies with this in mind. Not to mention I wanted to have two different sizes for different projects as well. The butterflies are colored with Copic Markers. My coloring skills are very basic, I don’t do much for shading and generally will only use 1 to 3 markers per color family to color. My patience and attention level to color is very short. Each butterfly took me about 45 minutes to color because I’m slow and again – not very skilled. That drives me nuts, but I knew what I wanted and I took the time one night (while I watched TV) to make it happen. Am I happy? SO VERY HAPPY. I love how they turned out. Do you love to color? How do you usually spend your time when you color? Start with a standard size A2 card (4.25″ x 5.5″) card and cover with patterned paper. Stamp larger butterfly and sentiment onto white cardstock with Copic friendly ink (like Memento) and the smaller butterfly on a different square of white cardstock. Color both butterflies with Copic Markers. Die cut larger butterfly with scallop rectangle die and fussy cut the small butterfly. Run a darker Copic marker around the edge of the small butterfly to hide the white sides of the paper. Glue or pop up the scalloped rectangle to the front of the card. Add some Wink of Stella to the butterfly. Add some small dimensional foam squares to the back of the small butterfly and a dot of strong liquid adhesive to the large butterfly. Adhere small wings over the large butterfly and use some tweezers to hold the middle down into the liquid glue for 30 seconds or so to make sure the glue bonds. Add some Wink of Stella to the small butterfly. Pick up your pretty dimensional card and think hard about who is deserving of this lovely little card. Lisa, These are absolutely stunning! So gorgeous! 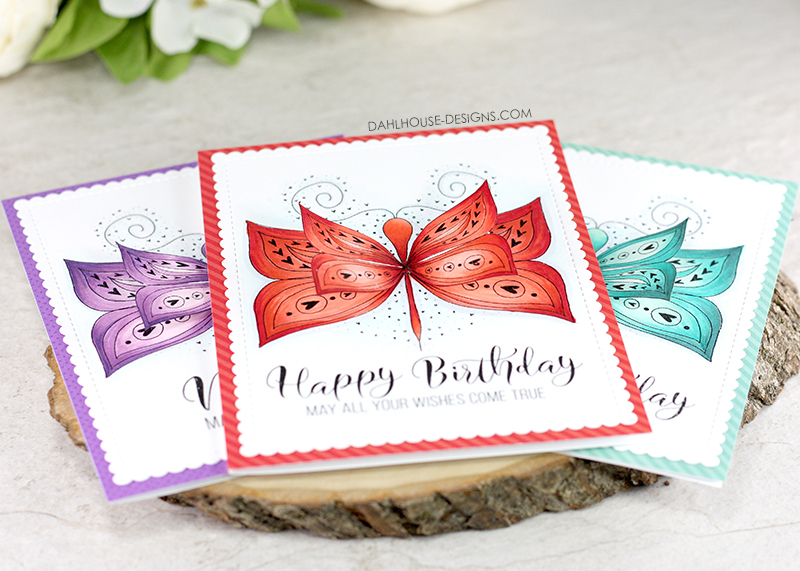 Beautiful stamp design and gorgeous cards! Your colouring is beautiful! I generally only have two or three Copics per colour family. 😛 My collection is small! Occasionally I will have the tv on while I colour, but usually it’s music. Have a lovely weekend! Happy 2019 my friend! 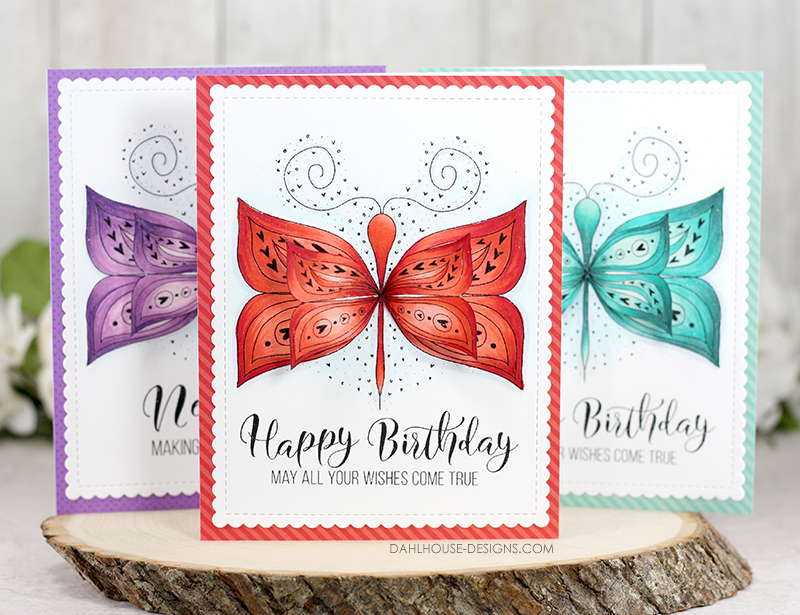 Love your choice of colours for these designs and love love those gorgeous sentiments! !